While the Eighth Doctor Adventures had taken over the Doctor Who name and character, the Virgin New Adventures series hadn’t given up. 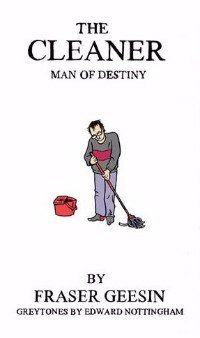 In fact, freed from being a Doctor Who series, at least in name, it had something of a late flourishing. 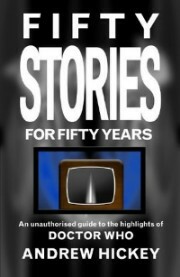 The stories instead followed the character of Bernice Summerfield, the companion for the Doctor who had been created by Paul Cornell in Love And War, and who had become one of the most loved of the Doctor’s companions, as she had adventures as a space-travelling archaeologist attached to the Braxiatel collection (something that had originally been a single line in a Douglas Adams script but here is turned into the setting for a series of adventures that continue to this day). The series kept going for several years with Bernice as the main star, and featured some fine books (Lawrence Miles’ Down and Simon Bucher-Jones’ Ghost Devices are both particularly good), and at least one masterpiece which we will be looking at in the next essay. But right now we’re not looking at the books, but at a new set of people who will make a big difference over the next decade or so. 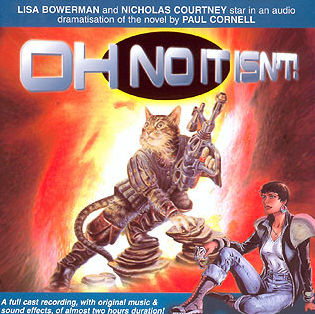 In the late 1980s, a group of Doctor Who fans using the name Audio-Visuals had produced audio cassettes, starring Nicholas Briggs, of their own Doctor Who stories, which had been modestly successful amateur productions and built up a little bit of a fanbase. Ten years later, with Doctor Who looking further from being on television again than ever, this suddenly seemed like a business opportunity. Would it be possible to do legitimate Doctor Who cassettes or CDs, with new stories featuring some of the old actors? Would it even be possible to make direct-to-video proper Doctor Who stories? Two companies decided to see if they could make the most of this opportunity. BBV, who we’ve discussed earlier in the essay on PROBE, started putting out cassettes starring Sylvester McCoy as “the Professor” and Sophie Aldred as Ace, and got slapped down by the BBC for straying too close to their trademarks, although they continued for many years to make recordings using legally-acquired Who-related characters like K-9, the Rani and the Sontarans, as well as Lawrence Miles’ Faction Paradox. Another organisation, involving many of the same people, was rather more successful. Big Finish Productions decided to stick much closer to the rules, and so they started out with a series of adaptations of the Bernice Summerfield novels, which they hoped to use to prove they were competent and so get a license to produce Doctor Who audios. 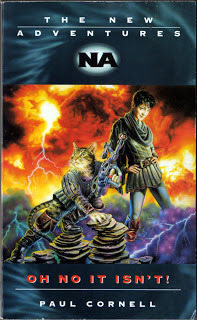 And so we get this, an adaptation (by Jacqueline Rayner, a wonderful writer in her own right, who we will be coming across again later) of one of Paul Cornell’s lesser efforts, the first of the Bernice Summerfield novels. Bernice herself is played by Lisa Bowerman, an actor who was best known to Doctor Who fans as one of the kitlings in Survival. As an extra bonus for the Doctor Who fans, this features an appearance by Nicholas Courtney, playing Bernice’s cat. Yes, Bernice’s cat talks here, because what we have here is a farce in the tradition of The Mind Robber, in which because of the actions of the fact-obsessed Grels (a rather wonderful creation of Cornell’s), Bernice becomes trapped in a pantomime-based reality, where everything runs according to the narrative rules of pantomime, rather than with any kind of rational system. I should divert here, a little, to explain what pantomime is, as these essays have American readers. I should, but I can’t, as the whole concept of pantomime is one that makes no sense except through experience — and I’m not sure if even then it would make sense to anyone who hadn’t grown up with it as a form of entertainment. Americans wanting to understand it will just have to cope, and imagine how I feel every time an American film or book talks about baseball. But the point is, this is a very, very, specifically British form of entertainment, and not in the way that those Americans who fetishise Britishness as Hugh Grant saying “golly” while Stephen Fry drinks tea think of it. It’s deliberately, consciously, alienating a large part of the audience — or at least it was in the novel. Because while in its original version Oh No It Isn’t! was the opening of a new era in a series of books which had been going for several years at that point and had fans worldwide, and thus was almost wilfully perverse, Big Finish were, to start with, going for a much smaller potential audience. The presence of former Doctor Who actors in the early Bernice Summerfield dramas shows exactly what they were trying to do — they were creating something that could be sold at conventions and through SF speciality shops, and to an almost entirely British audience. This was an audio adaptation of a spin-off novel based on a character who in turn was a character in a series of spin-off novels. If you’re at the point where you’re buying this, you’re not going to let pantomime put you off. Of course, Big Finish were doing this as a trial run — to show that they could make, entirely legally, stuff that was “a bit like Doctor Who” and have it sell to Doctor Who fans. It was a proof-of-concept so they could go after the license to produce Doctor Who itself in audio format. The remarkable thing was that it worked rather better than it had any right to. Big Finish did, of course, get the rights to produce Doctor Who audio adventures, and we will be dealing with a number of those in the essays ahead, but the Bernice Summerfield range has remained far more popular than anyone could have predicted. 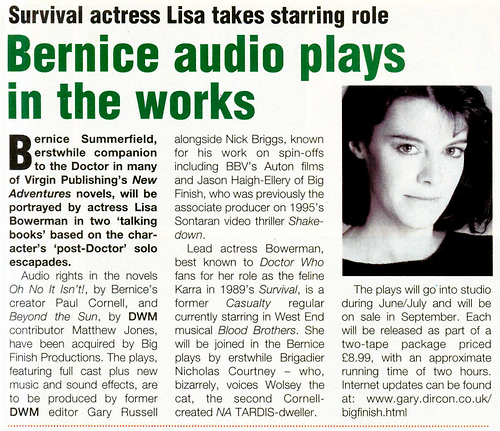 Fifteen years on, there are still regular series of Bernice Summerfield audios from Big Finish every year, as well as guest appearances from the character in their Doctor Who range. 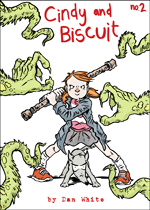 And when the New Adventures finished (to jump forward a little), Big Finish took over the character in book form, too. There have even been guidebooks just to the adventures of Bernice Summerfield, and recently Big Finish produced a short animated Bernice adventure. Nobody could have predicted from this that Big Finish would still be producing audio dramas — and branching out into filmmaking — fifteen years later, and be more successful than ever. But then nobody could have predicted that the Bernice-centred New Adventures were about to produce the best Doctor Who novel to date. Hi Andrew, I’d have rather emailed, but this is just a quick note to express how much I’ve enjoyed your music books. (I’m a fan of Who, too). 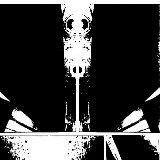 I’ve reviewed (rather poorly, but glowingly) the Beatles in Mono at my blog. I will review the Beach Boys one and the Monkees in due course. Thanks, David. In case you’re not aware, I have my own blog — linked in my name above — which is probably more appropriate for talking about my music books than this one. On the other hand, people saying nice things about me is always welcome in any forum.